So ever since baby number three came around (about six weeks ago) I’ve been trying really hard to be more healthy. I hate dieting, counting calories etc. (who likes it?) So I’ve been working on just changing my lifestyle to a healthy, happy, state that I can maintain. A huge aspect of making healthy eating maintainable for me is that food still has to be filling and taste good! 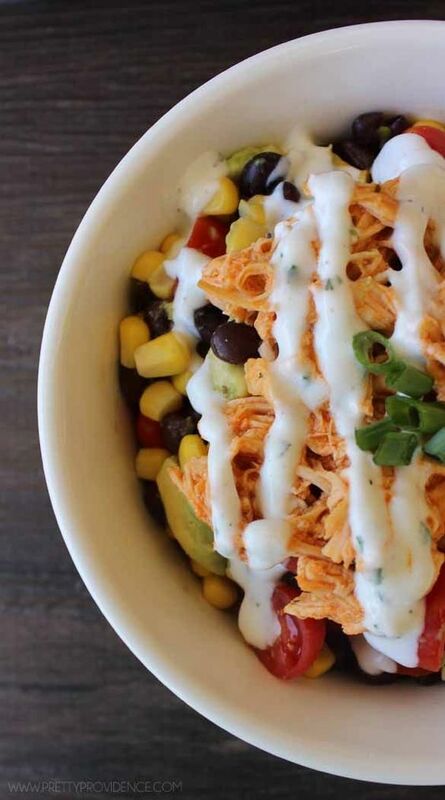 These healthy buffalo chicken bowls manage both of those things, with flair! My sister gave me the recipe, and I have eaten them at least twice a week ever since.. guilt free! Cook chicken, garlic and hot sauce to slow cooker and cook on low for 6 hours or on high for 3 hours. When chicken is cooked through, shred it and set aside. In a separate small bowl mix together your Hidden Valley Greek Yogurt Dressing , Greek yogurt and milk and stick it in the fridge. Next, drain and rinse your corn and black beans and add them to a bowl. Rinse and half your cherry tomatoes and add them to the bowl as well. Lastly, dice your avocados and add them to the mix! 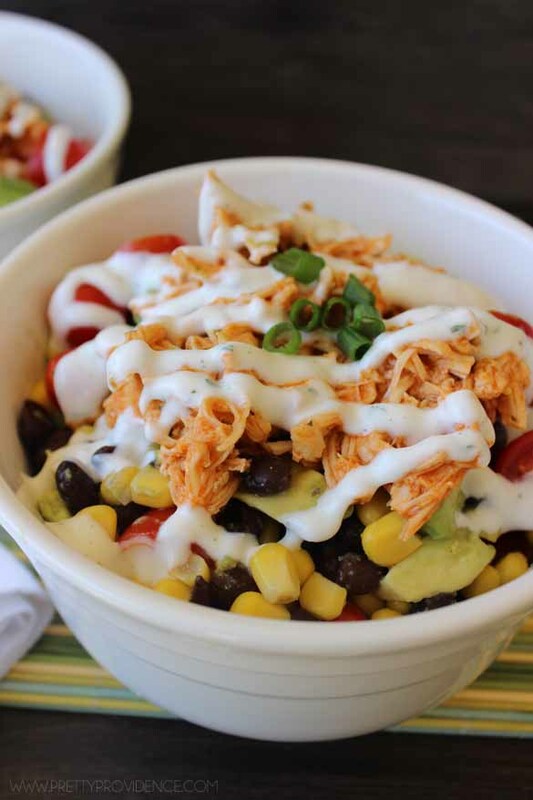 Assemble your bowls by adding your veggie mixture, topping with chicken, and finishing them off with some healthy Greek yogurt ranch dressing! 0 Response to "HEALTHY BUFFALO CHICKEN BOWLS"